Dave Kulju - Electric Guitar on "Dionysian Stream"
Chris Rossi - Piano on "A Brief Eclipse"
Latin for "globe of the earth", or more poetically "circle of the world", Orbis Terrarum is a legend that was applied to many ancient maps, then centered around the Mare Internum - meaning the Mediterranean Sea. 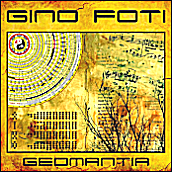 Born in Sicily, and exposed to a variety of traditional music from countries bordering the Mediterranean throughout my childhood, I found it an appropriate title for my first world fusion release. Growing up in a household where European classical compositions and folk songs from throughout the region were routinely played on our radio and record player (yes, I am *that* old) these styles of music and the cultures they originate from have always been close to my heart. After emigrating to the United States in the early seventies, I began listening to the jazz fusion and progressive rock artists of the day and found that the juxtaposition of Western classical elements and ethnic rhythms, along with the finesse and improvisation of jazz and the power and intensity of rock, were musical forms that were at once familiar and brand new to me. In the spirit of those musical hybrids, I hope to have created a synthesis between diverse musical elements and cultures, without sacrificing too much of the essences of each, while further exploring the dichotomy of rhythm and melody of the bass guitar with this release. "I am Dionysus, son of Zeus, come back to Thebes, this land where I was born. Midwifed by fire, delivered by lightning's blast. The ancient Greeks spoke of two spiritual streams to which people could belong: the Apollonian and the Dionysian. Apollo embodied the principles of reason, harmony, and order in the Universe, while Dionysus represented passion, rebellion, and chaos. Through the ages, music has been considered the most Dionysian of all art forms, as it appeals directly to humanity's instincts and emotions more than their logic and reason. However, were it not for the opposite Apollonian characters of form, structure, beauty, and individuality, music would have much less variety and would not be as enjoyable to listen to. This composition is a study in tension and dialogue between structure & order and impulse & passion, with an obvious emphasis on the latter two. It is centered around a call-and-response solo section between synthesizer and electric guitar, backed by bass guitar and various percussion instruments from around the world - mostly African "talking" drums (adondo, atumpan, dondo, gan gan) and timbales (Cuban kettle drums/timpani), with the latter also performing tradeoff solos throughout the recap of the main section. It features my Electrum bandmate, guitarist Dave Kulju. The title is taken from the second day of Kwanzaa, and means "self-determination" - one of the Seven Principles (Ngozo Saba). The associated pledge is for individuals to define, name, create, and speak for themselves - instead of being defined or being spoken for by others. The idea is to design a positive future and then vow to make that prophecy a self-fulfilling one. In this arrangement, fretless bass guitar plays rhythm, lead, and melodic themes over African drums (talking and stick) and vocal phrases, xylophone, berimbau (musical bow of African origin), kalele drones (steel drums), as well as added synth beds. As the first composition completed in a project that began production on July 04, 2004, I thought the title and subject matter were quite appropriate. The instrumentation includes: doumbeks (Mediterranean/Middle-Eastern goblet drums), saghat (finger cymbals), classical guitars, fretted and fretless bass guitar, and acoustic piano. The heart of this piece features the latter two sharing a question-and-answer section before a guitar solo in the Rondeña and Bulerías flamenco styles, all in 6/8 time signature. This arrangement was assembled from a discarded Electrum composition. More melodic in content and laid back in mood than my usual writing, it finds new life in this release with different chord progressions and the addition of a fretless bass solo, electric guitar loops, and various Mediterranean and Middle-Eastern percussion instruments. Shorter than one day in length, ultradian rhythms are endogenous patterns that modulate our mental, physical, and emotional systems. These include feeding patterns, heart rate, rest-activity cycles, and "hemispheric dominance" within the brain, which I thought was a nice tie-in to the album's concept and some of the artwork. I chose several Rumba (aka Rhumba) rhythms as the focus of this piece since their primary sources are from both hemispheres, and I thought that the contrast of flowing solos over their staccato beats would be interesting. This composition includes classical guitar, piano, fretted and fretless bass solos, as well as a question-and-answer section with all of the above instruments, over a foundation of Latin percussion including: congas, bongos, claves, and Cajun triangle. This arrangement shares a lot of qualities with the last three tracks (hence its listing position) although sounding completely different. It begins with classical guitar themes over a synth bed, like "Strong"; it contains various melodic themes recycled from unused Electrum material, like 'Essence"; and for the first half of the tune the guitar is playing Rumba rhythms, like "Ultradian". It also contains a bass guitar solo which acts as a bridge between the modalities of the two halves of this piece - major for the first, minor for the second. Each half features classical guitar and piano solos over a bed of bass guitar and various ethnic percussion instruments. "And this I believe: that the free, exploring mind of the individual human is the most valuable thing in the world. Fretless bass guitar and acoustic piano take turns in melodic and lead roles over Latin jazz-styled chord progressions, while being accompanied by doumbeks (aka doumbec, darbuka), zills (finger cymbals), and other Mediterranean and Middle-Eastern percussion. In Daoism, the concept of Dao (aka Tao) is regarded as the natural order of the Universe, unexplainable since it exceeds senses, thoughts, and imagination, from which all myriad creatures (wan-wu) are originated. Literally, "Ten Thousand Things", Wan-wu is used as a metaphor for all living things, or the whole of creation. In the Daoist view, all manifestations of the Dao are generated by the interplay of two archetypal poles, Yin & Yang. Nothing is only Yin or only Yang, so the natural order is one of dynamic balance between the two. For this arrangement, glass bowls and bass guitars act as the opposite poles striving for balance. Added instrumentation includes: ceramic bells, gourds, lom bak (Javanese hand drum), and synthesizer. This composition features various hand percussion instruments from Southeast Asia (clappers, hand drums, cymbals, gongs, singing bells, shakers, scrapers, etc. ), fused with slap bass guitar, hard rock/heavy metal-styled electric guitar, electric violin, and various synth beds in a dark and sometimes dissonant arrangement. I chose the title from its associated lyrics as they reflect the contents of this composition fairly accurately. Structured as a sonata allegro (exposition - development - recapitulation) with an intro and coda, and using elements from the rock, jazz, funk, and Latin worlds, the main instruments: acoustic piano, bass guitar, and electric guitar orbit around drifting synth beds and spacy, eclectic percussion giving the tune a loose, elastic feel, and an overall relaxed mood. This arrangement showcases keyboardist Chris Rossi on piano. A "tongue-in-cheek" piece with bass guitar and acoustic piano playing rhythm, melody, and lead lines over various Merengue, Murga, and Salsa rhythms performed on electric guitars, congas, cowbells, and hi-hat cymbals. The musical equivalent of drunken cannibals at a nudist colony. The title is a maxim used by the ancient Greek philosopher Heraclitus of Esphesus, "panta rhei kai ouden menei", which can be translated as: "all things are in a state of flux and nothing is permanent". An arsenal of Mediterranean lutes and stringed instruments, including: acoustic and electric bouzouki, baglama, cumbus, oud, saz, and tzouras take their turn over bass guitar ostinatos and several percussion instruments, including riq (aka rik or riqq) - an Egyptian tambourine, saghat, and doumbeks playing in various rhythms, mostly Maqsum (aka Maksum or Maqsoum) and Malfuf (aka Malfouf) - both popular Egyptian and Fertile Crescent rhythms. This arrangement also includes a panned call-and-response doumbek solo. A classical guitar and acoustic piano ballad that blends European classical, Spanish flamenco, and Latin American folk music. Fretless bass guitar is joined by two acoustic pianos - a Yamaha on the left channel, a Steinway on the right - as well as a synth string section, in a piece that strives to balance rock, jazz, European classical, and Mediterranean folk music. The arrangement is structured as a theme and variations waltz (3/4 time), with the percussion instruments (doumbeks, riq, tar, and deff) playing mostly 6/8 rhythms: Okruk and my own Karshilama variant. This composition is dedicated in loving memory of my father.